One of the many thousands of wallpaper, or ‘paper hanging’, designs from our collection, this one dated 1849 (catalogue reference BT 43/85/60220). Among The National Archives’ most visually captivating collections is its stunning array of almost three million designs used for textiles, glasswork, metalwork, ceramics, furniture, wallpaper and other decorative arts and manufactured objects. We hold copies of these designs in the form of drawings, paintings, photographs and product samples, sent to the Designs Registry, part of the Board of Trade, to be registered for copyright protection between 1839 and 1991. This guide explains how you can locate individual images or samples of these designs, known as ‘representations’, within our collection. There is also advice on how to find other details about each design, including the identity of the copyright owners or ‘proprietors’ – usually the manufacturer or retailer rather than the designer. As registration was not compulsory, there are many commercially produced designs which you will not find in our records. See our other intellectual property guides for advice on trade marks, patents and copyright. For advice on modern-day registrations contact the Intellectual Property Office. 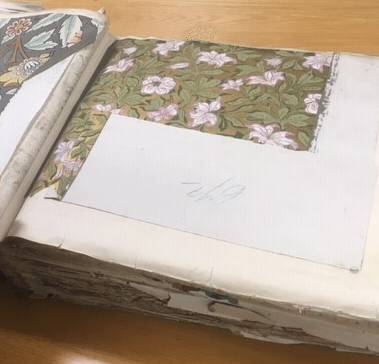 Until 1839 there had been copyright protection in the UK for some textiles, but most areas of the decorative arts, such as glass, metalwork, ceramics and wallpapers, had no copyright protection at all. This changed with the 1839 Designs Registration Act which provided protection for all ‘ornamental’ designs. From 1839, to apply for copyright protection you had to submit your design to the newly created Designs Registry, part of the Board of Trade and later to fall under the jurisdiction of the Patent Office. Registration protected the decorative elements of the design from being copied and manufactured without permission. Details of how an item worked – the mechanics of the design – were protected separately, by patents of invention (though patents did slip into the registered design records sometimes). Today designs are registered with the Intellectual Property Office. Although the system used for registering designs continued to change as subsequent Acts of Parliament extended and amended design copyright law, from 1842 the process always involved two basic record types: representations and registers. When a design was submitted for copyright protection, details were added to two different types of records: design registers and representation books. A representations book (catalogue reference BT 43/102). Representations were drawings, paintings, photographs or samples of the design, such as wallpaper or textiles, submitted at the time of registration. We hold representations for around 2,950,000 designs. Inside a representations book (catalogue reference BT 43/102). The representations were pasted into large bound volumes, and later stored in archival boxes, and have a registered design number stamped on them. The same number is recorded in the register so that you can cross refer between the two record types. A design register (catalogue reference BT 53/111). At The National Archives, these registers and representations have been split into various record series, each one determined by the most recent Act of Parliament in place when they were registered. This section outlines the different search methods you can use to locate registered design records but for advice on which of these methods you can use for a particular period or set of years, see sections 5 to 11. A search for a representation or register entry for any design begins in our online catalogue. The search methods that you can use depends very much on the date the design was registered and the parliamentary act applicable to its registration. However, if you do not know which date or act apply to a particular design, all is not lost – for some designs from some years you can search using other details you may know about them. Successful searches will produce catalogue references (which for registered designs always begin with ‘BT’). Once you have found a catalogue reference for a representation or register that you would like to see you will need either to visit us, so that you can see the original in person, or request a copy to be sent to you (£). Although vast numbers of registered design records survive, there are instances of registration numbers without corresponding records, and of numbers that were not used. A wallpaper or ‘paper hanging’ design registered in November 1844 by William Evans of Shoreditch in London (catalogue reference BT 43/78/22871). In some instances, you can also search by proprietor using the indexes to proprietors which were created as part of the original records but you will need to visit us to use them. See the tables in sections 5 to 11 for details of which records come with indexes. A wallpaper design registered by Richard Goodlad and Company of Newcastle-on-Tyne in 1857 (catalogue reference BT 43/97/111263). Objects whose design has been registered should have a design number marked on them. However, in the case of wallpaper and textiles, usually used in sections, the design number is unlikely to be visible. If you know or can find a registered design number you should be able to find the respective register entry or representation in our collection, though it will be easier for some than for others. Using the tables in sections 5 and 9 to 11 of this guide, locate the design number range within which the number falls (numbers were reused so you will need to consult all the tables as your number may appear in more than one table). In section 11 the range 518644-548919 includes our number, 523000. Ensure the number range applies to the right kind of classification for the object. As the table in section 11 indicates, the only classification details we have for the respective design number range is ‘non-textile designs’. So our glass vase fits with this classification. Use the table to establish which catalogue references to search within. The table in section 11 indicates that, for representations we should be looking between BT 52/1 and BT 52/55 for our design number range. Click on the respective catalogue reference links in the table. For 523000 we need to click on BT 52/1-55. Browse through the BT numbers until you get to one for the more specific design number range which includes your number. For 523000 you will need to browse to BT 52/12 (which covers design numbers 522919-523306). Click on the catalogue reference for the respective catalogue description page which includes your number and follow the on-screen instructions for your ordering and viewing options. This is the catalogue description page for BT 52/12. A furniture fabric design registered in 1877 (catalogue reference BT 43/373/313643). If you are viewing a representations book or register here at The National Archives in Kew you will need to page through the book until you arrive at the page for your design number. Diamond marks were printed, engraved or otherwise marked on an object to authenticate its copyright registration and add a layer of protection against fraud. Diamond marks were only in use between 1842 and 1883 and only for objects registered under the terms of the 1842 Ornamental Designs Act. If the object you are interested in has a diamond mark, you can use the mark to track down the registered design number and therefore the records themselves – see section 7 for more detail. A printed fabric design registered in 1882 (catalogue reference BT 43/346/388554). The British Library holds copies of the Official Journal of the Patent Office, published weekly since the mid-19th century. The journal’s ‘Designs’ section lists registered designs by date of registration, class, design number, and proprietor, providing the address of the proprietor too. 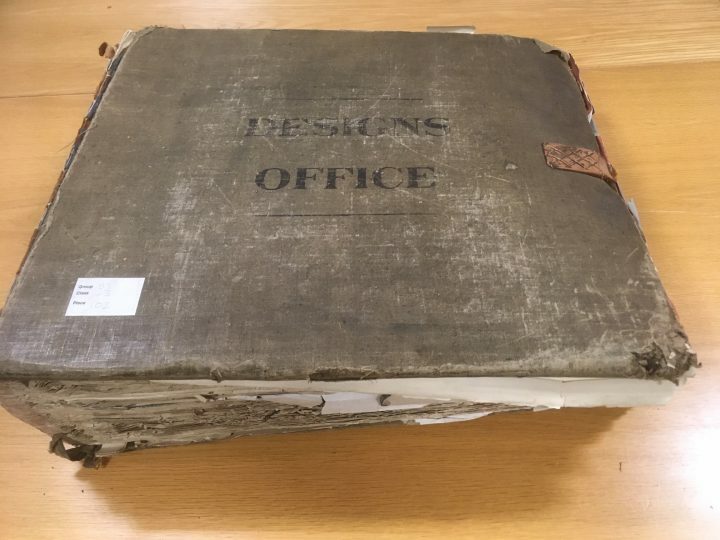 It may prove particularly useful when in search of a design registered after 1884 (from which point our own catalogue is short on descriptive detail). These records are for designs registered under the 1839 Copyright of Designs Act. 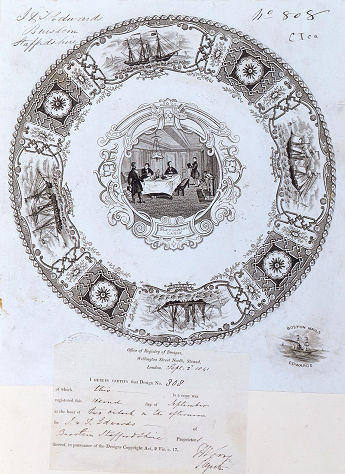 This representation for a plate design (catalogue reference BT 42/4/808), registered in 1841, was classified as ‘other than paper hangings’. The registration certificate is pasted below the representation. The act classified objects either as ‘paper hangings’ – in other words, wallpaper – or anything ‘other than paper hangings’, which included all other objects, from chandeliers to telescopes. If the search proves fruitless, follow the search instructions in section 4.2. 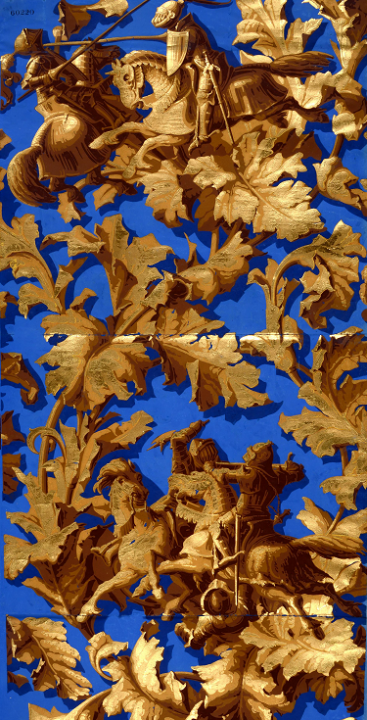 This section covers records for designs registered under the 1842 Ornamental Designs Act. This act repealed the 1839 Act (see section 5) and sought to confine registration exclusively to ornamental designs, excluding the practical element of a design – though these would subsequently be covered by another act (see section 8) as well as by patents of design (see our guide to patents of design). In practice, however, many functional designs were effectively registered under the guise of a registration of the ornamental element of the design. 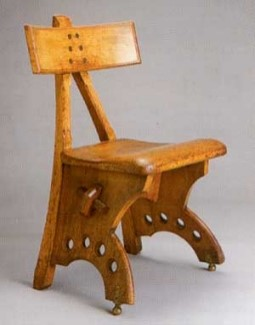 The ‘Granville’ chair and (above) its representation, registered in 1870 (catalogue reference BT 43/58/245877). A typical example of how the registration of the ornamental elements of a design could be used to surreptitiously register the functional elements of the design too. The design classification codes were expanded under the terms of this act, meaning representations were filed under more precise classification categories, determined by the materials that the designed objects were made of. Although attempts were made to cover everything, the lace and the earthenware classifications became used as miscellaneous categories. ‘Diamond marks’ were another innovation brought into use with this act (see section 7). If you don’t have any of these details but your object contains a diamond mark, you can use the classification and date information that the diamond mark provides to find a record (see section 7). As a last resort, you can, instead, click on the catalogue reference links in the table below for the respective classification type and browse through the record descriptions, though as there are hundreds of thousands of catalogue entries you will need to narrow your browsing range to a smaller range of dates. 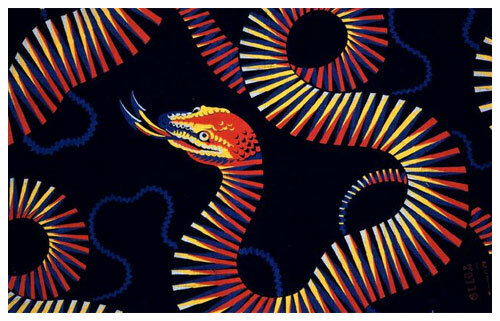 (1) ‘Class 11, Furnitures’ were defined as printed fabric designs with a repeat pattern greater than 12 x 8 inches. 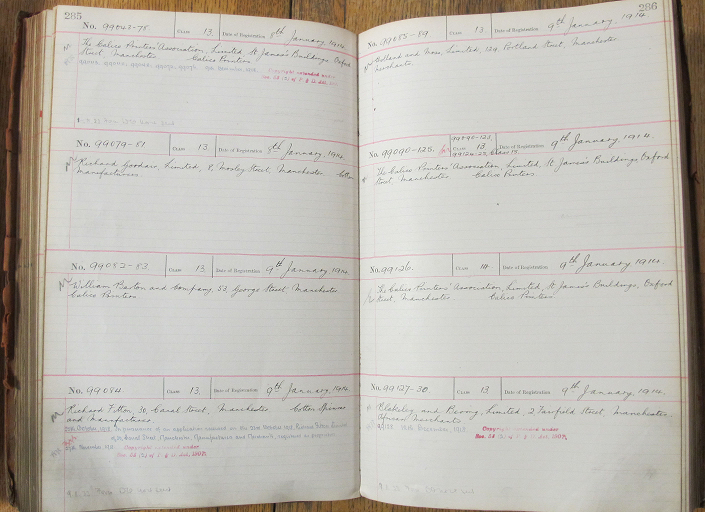 (2) The registers in BT 44/33-37 contain indexes of proprietors (volumes A and C-E – volume B is not available). BT 44/38 is an alphabetical register of the proprietors in BT 44/33-37. Diamond marks were brought into use with the 1842 Ornamental Designs Act. They were no longer used once the 1842 Act was replaced by the 1883 Act (see section 8). 7.1 What were diamond marks? Diamond marks were printed, engraved or otherwise marked on an object – for example, on the underside of china or the reverse of printed fabric. The mark was in the shape of a diamond with numbers and letters at specific points to represent the type of material used and the date of registration. However, in the case of wallpaper and textiles, usually used in sections, the diamond mark is not always visible and sometimes it may not be possible to locate it. Diamond marks demonstrated that a design was registered, that it was designed in Britain and added a layer of protection against fraud. Between 1842 and 1883 they were issued with the registration number when a design was registered by the Patent Office, but only for designs registered under the terms of the 1842 Ornamental Designs Act..
Two diamond marks, one from 1861, the other from 1881. From 1842-1867 letters were marked on the left point of the diamond and numbers on the right. From 1868-1883 letters were marked on the right point of the diamond and numbers on the left. If the object you are interested in has a diamond mark, you should be able to date the design and therefore the object itself. The fact that a design has a diamond mark at all tells you that it dates from between 1842 and 1883. The number codes on a diamond mark represent the day of registration and the letter codes represent the year or month the design was registered. Use Appendix 1 to interpret month codes and Appendix 2 to interpret year codes. These records are for designs registered under the 1843 Utility Designs Act. This act sought to extend the range of designs that could be protected by copyright law, beyond the strictly ornamental designs covered by the 1842 Act (see section 6). The appearance of designs of utility could now officially be registered under copyright law, thus causing confusion with patent law. 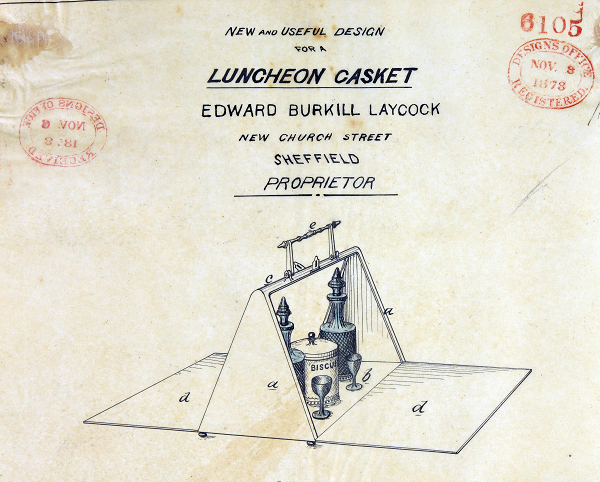 A representation for a ‘luncheon casket’, registered in 1878 (catalogue reference BT 45/29/6105). 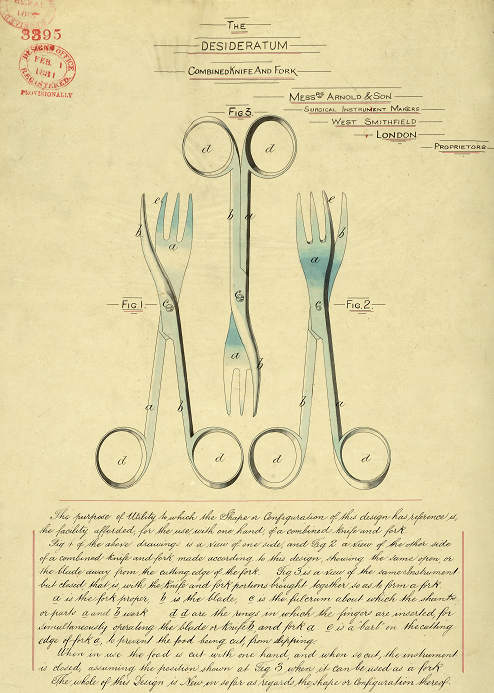 The registered design for Arnold and Son’s ‘Combined Knife And Fork’ (catalogue reference BT 47/9, registered design number 3395). If you know the registered design number, follow the steps outlined in section 4.2. If you don’t know the registered design number you are left with the herculean task of leafing through the representation books hoping to spot your design – or searching through the registers until you find a description for your design. (1) The indexes do not cover the the full range of dates shown. (2) We do not hold records for design numbers 1-19 as they were missing before the records were transferred to The National Archives. These records are for designs registered under the 1883 Patents, Trade Marks and Designs Act. Following this act the Designs Registry, by now part of the Patent Office, all but abandoned the classification system and did not categorise designs according to material or type – except for sculpture. A Christopher Dresser textile design registered in 1885 (catalogue reference BT 50/30, registered design number 23268). The representations for this period have not been described in our catalogue in descriptive detail so it will be difficult to find a record if you don’t know the registered design number. However, if you find an entry in the registers, which are a little easier to search within, it will provide you with the design number. If you do know the registered design number (which you can obtain if you find an entry in the registers – see above), follow the steps outlined in section 4.2. If you do not know the registered design number your chances of finding a record depend upon the remote possibility that you may know the year, or even the month and year, when the design was registered and your willingness to leaf through the representation book covering those dates. You can view the covering dates of books and registers by clicking on the catalogue references below and browsing through the series. These records are for designs registered under the 1907 Patents and Designs Act and subsequent acts. Following this act the Designs Registry classified all designs as either textiles or, for everything else, non-textiles. 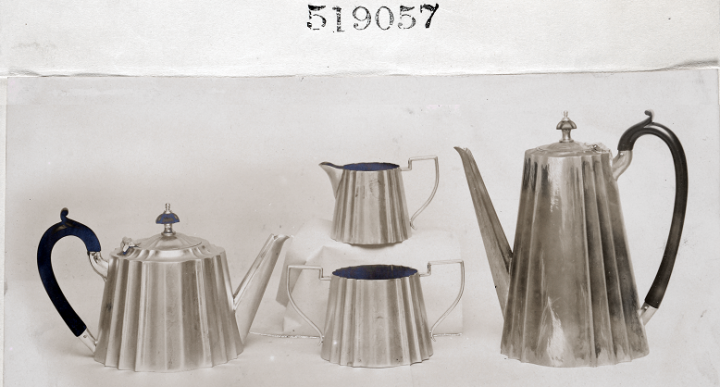 A tea set whose design was registered in 1908 (catalogue reference BT 52/1, registered design number 519057). 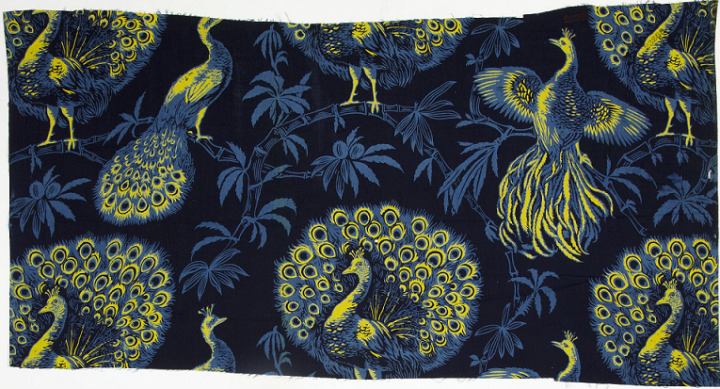 Representations for non-textile designs came increasingly in the form of photographs. To search for a record if you do know the registered design number, follow the steps outlined in section 4.2. If you do not know the registered design number your chances of finding a record depend upon the remote possibility that you may know the year, or even the month and year, when the design was registered and your willingness to leaf through the representation book or register covering those dates. You can view the covering dates of books and registers by clicking on the catalogue references below and browsing through the series. Read Inventions that didn’t change the world by Julie Halls (Thames and Hudson, 2014) and listen to the related podcast. 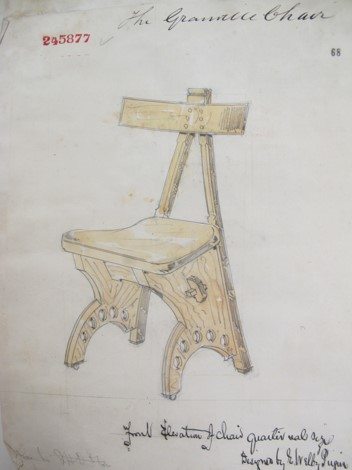 Read The National Archives’ blog posts on design registers. Listen to the podcast A momentous question: decorating the Victorian home. Listen to the podcast Inventions that didn’t change the world: a history of Victorian curiosities. *From 1-6 March 1878, W was used for the year in place of D.